On modifications of Mr. Goto’s personal Df: no major modifications, only some small ones. This lens is 40 year old, the lens shade is almost 40 year old. 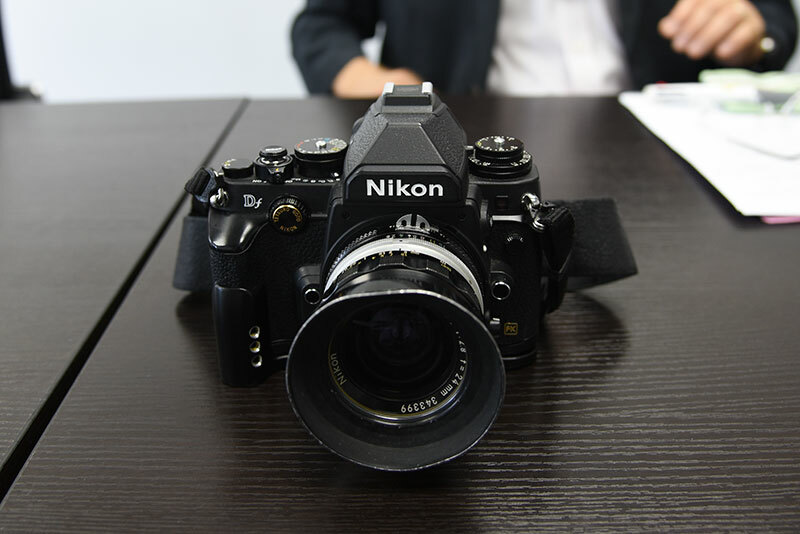 The white UV is 30 year old, made by Nikon’s predecessor Nihon Optics. I am not a collector so this lens is purchased from a friend of mine. When I showed him my Df he said the lens and UV fit the Df better. Of course I have modern AF lenses but the Df overall design style is better with old lenses. 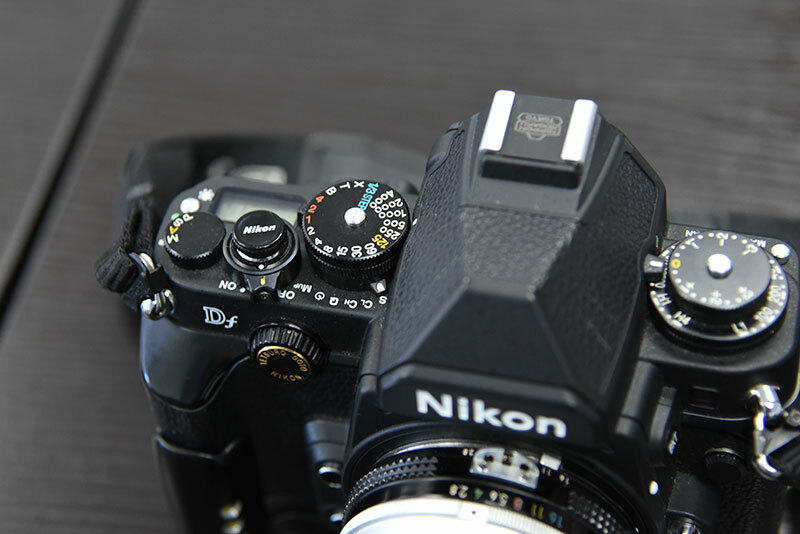 Many Df lovers make DIY parts for the Df, such as the hot shoe cover with a Nikon logo and power switch. I color the dials with my favored colors. They are easier to be recognized in dark. Frequently used buttons in the back are taped with red film sold in market. The dial in the front is etched with my name and Nikon. Nikon Japan used to provide this service at 3000-4000 Yen but they no long do this. At the bottom I added a grip, sold by third party. With the grip all the fingers can wrap around. The original grip is kind of slippery so I modified it. To reduce weight I modified the grip by cutting some holes, took away a few things to expose the serial number. It saves 4g of weight with these holes. The screw to secure the grip to camera is modified by me. The batter door was black but I replaced it with a silver version. On why Mr. Goto doesn’t like silver version of Df which it’s popular in China: the overall silver style is not my favor. Old cameras used to have silver and black versions as well but the Df silver version is not like the one before. Actually our survey says silver version is about 51% of sales. When we introduced the Df we made more black version but there were more and more people choosing the silver version. I modified my Df viewfinder with the split focus screen. With the manual focus lens this is more convenient. On Replacing focus screen: it’s not that difficult to replace the focus screen. There is Facebook Df group with 160 plus users and increasing. Many (DIY) ideas are shared in the internet and I learn some of these from them. Coloring dials based on one’s like and such are not that difficult. Df is different than other DSLR in that there are rooms for DIY. On successor of Df in Nikon 100 Year Anniversary: the company position is that it needs Df sales volume increase to justify the investment of developing Df successor. Although Df reviews are very good buy overall sales volume is not. If we don’t buy the Df now, it’s hard to expect a Df successor. If you like Df, please buy it now. Personally I have been thinking about Df successor, not like the Df now but more retro style. Design drawings and the overall product design are ready. Answering the question of Df being to too thick and handling, plus plastic feeling: Df launch was in fast schedule. 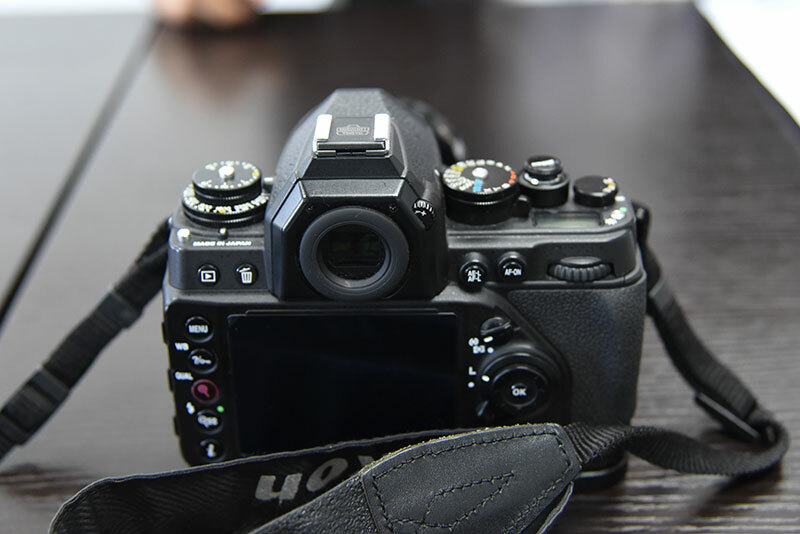 Although it integrated key components from D4 such as CMOS sensor but the it didn’t meet user’s requirements. Our current products such as D850 and D7500 are much thinner now. If we were to launch Df successor with D5 and D750 technology we can achieve thinner and smaller requirements. I didn’t buy the silver version because the metallic feeling is not there, unlike previous F series metal feeling. The top of the camera is not plastic in fact, it’s metal. The whole body is made from metal except the area around lens release button. The shell coating didn’t reflect the metal feeling. On split screen and focusing with manual lens: there is a focus assist in Df but it looks like users are not satisfied, some may install a split screen. In fact not only Df but other Nikon DSLR and DSLR can replace the focus screen with a split type. A small Taiwanese company provides parts but they are unknown. 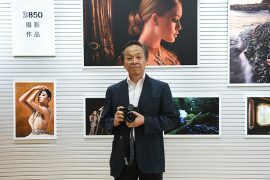 On Df platform being the same as D600 and user expectation of Df successor: Df was introduced four years ago, obviously it can’t be compared to today’s DSLR. If the new Df were considered for its functions, there would be many improvements. On Df sensor mega pixels that were considered 36 and 24mp but settled down on the D4 16mp: High MP has limit to high ISO and high dynamic range. Why the D4 sensor decision? 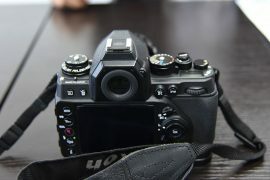 Because its low MP sensor has excellent high ISO performance. If we were to increase MP to, say 24 to 30MP, I think it’s boring. If we use D5 sensor its high ISO is very good. 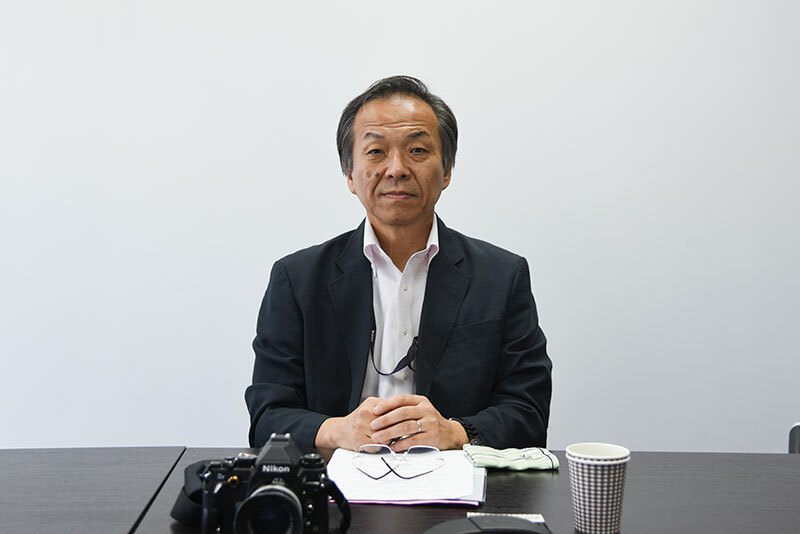 Otherwise we may go for D850 sensor. There could be two versions, a D5 version and a D850 version to satisfy more users. However, fast shooting rate such as 10 fps won’t be there and I wouldn’t put video in there too. If we put all the features in the market today to (a Df successor), how does it differentiate from cameras in the market? When we designed Df back then we didn’t consider every potential user, only a few niche customers. So we throw away some unnecessary features. On mirrorless and Nikon S2 style mirrorless: I have considered many options. Mirrorless cameras can be made thinner body but without the mirror shutter sound and vibration are gone, although they can be simulated electronically. How to integrate these technologies and ideas is one thing, how to execute and to build products is another. On Nikon future mirrorless and retro style of Olympus, Fuji and modern style of Sony, suggestion of combing retro and modern style: full frame is the trend. 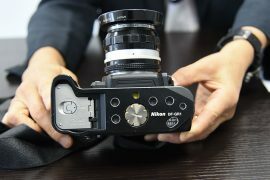 If Nikon will go mirrorless it must be full frame. On Sony A9 being driven by sensor technology: D5 is designed by Nikon, made by other company obviously. 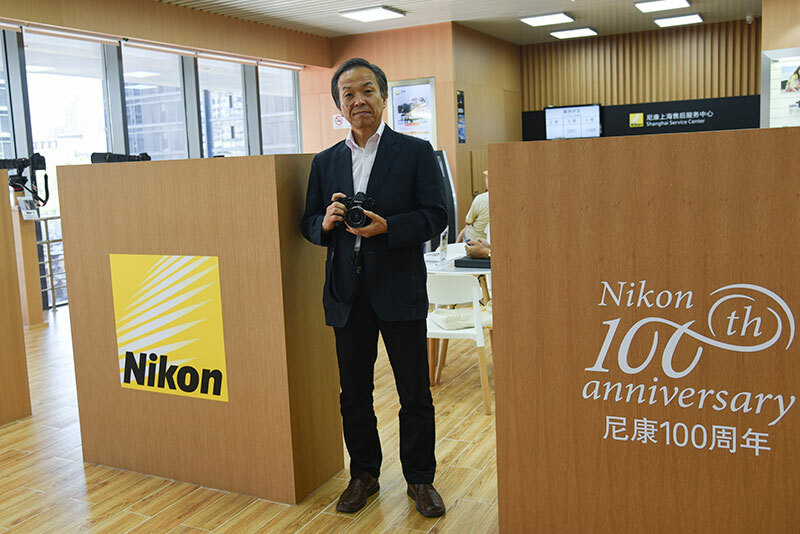 Nikon customer base is very broad, from novice to enthusiasts to prosumer to professional, that’s Nikon’s advantage. Olympus, Sony and Fujifilm can only cover a small part of that. So far there is no professional using their products. So when they develop products, even like retro style, they only try to meet these people and that’s only what they can do. Their customer base is limited anyway so they have limited view in developing products. If we were to take everyone’s features to integrate to Nikon products like you suggested, Nikon would never do that. Of course we would consider good stuffs, mostly things behind the back. Nikon would absolutely not consider overall view, design style, and function from others. 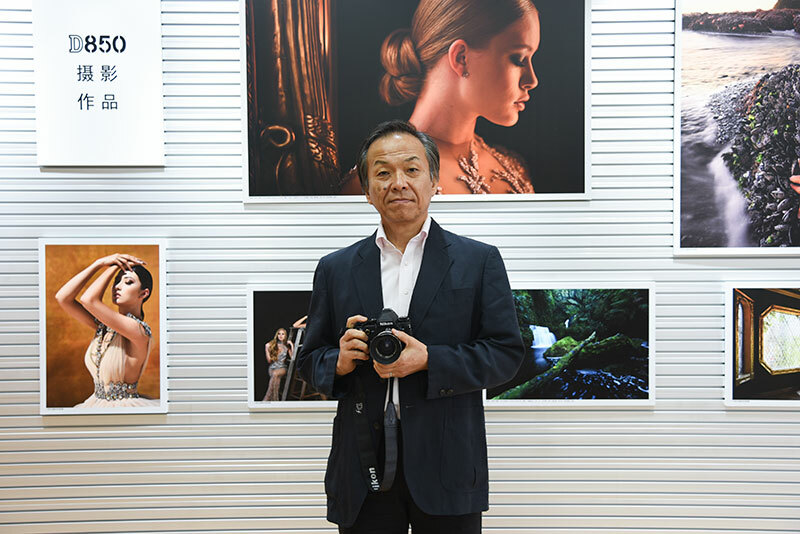 Because Nikon has almost 60 year history of making cameras and we have been communicate with all kind of customers and listen to them. With such experience we are a level not those companies can be compared. If we were to introduce a mirrorless camera, we would not be like them, such as pushing out a lot of models. We will lock in customer’s main requirement to introduce a new product. If fact before A9 was introduced, Sony went through a lot failure internally. Nikon has a lot more failure experience than Sony. Thanks for the translation Jeff! 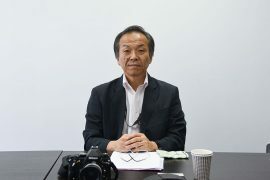 This entry was posted in Nikon Df2, Nikon Mirrorless Camera and tagged Nikon full frame mirrorless camera, Nikon interviews, Nikon large sensor mirrorless camera, Nikon Z mirrorless camera interviews, Tetsuro Goto. Bookmark the permalink. Trackbacks are closed, but you can post a comment.